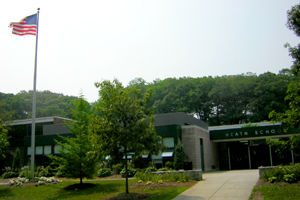 The Heath School serves the Chestnut Hill neighborhoods and has a population of 575 students. Heath’s core values are: Respect, Grow, and Engage. The school places a high value on student achievement and teacher collaboration. We are strongly committed to promoting equity and include as a goal in the School Improvement Plan that all students will have the opportunity to achieve at high levels. The school has an active Equity Team comprised of faculty members from the school, a PTO Diversity Committee that coordinates events for parents and families, and the Heath Family Partnership that fosters connections between families in the METCO program and Brookline residents’ families. Welcome to Heath School's webpage. Through this site, you will be able to see a calendar of upcoming events, find access to teacher webpages, read our Leadership's Message and much more! Looking for a CORI form or other important forms from the Heath School office? Wondering how to contact the school? Interested in getting involved with our Parent Teacher Organization (PTO)? Are you interested in finding classroom websites and contact information? Are you looking for Aspen to access student information? Looking for Information on Heath's After-School Activities Program? Wondering about Heath's Extended Day Program? Looking for information about Professional Development opportunities? Seeking access to important sites such as Aesop or X2? Are you looking to sign-out technology? Seeking information about Heath's school philosophy?